Pembury Dental Surgery follows a policy of preventative dental care. We therefore recommend having regular check-ups so that any problems with your teeth and gums can be identified and treated at an early stage. 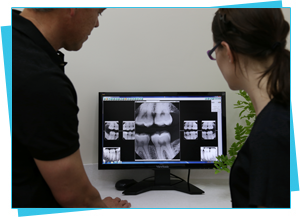 X-rays will be routinely taken and our modern digital x-ray allows significantly less radiation than conventional radiology. Good oral health is not just about the teeth; therefore our dental examination will also include a mouth cancer screening, soft tissue assessment and identification and prevention of gum disease. At Pembury Dental Surgery we understand that good oral hygiene and preventative care must begin at an early age. Parents are advised to bring their children to the practice from a young age and we encourage regular visits to the dentist for check-ups. We strive to provide your child with the best dental care available to secure their future dental health. To help you, we actively involve you and your child in dental education so that the importance of a good dental regime is fully appreciated. Our younger patients are educated in the correct way to brush and floss their teeth, as well as highlighting the advantages of following a healthy diet. We routinely check the development of teeth and the jaw and refer to a specialist orthodontist when treatment is indicated. Children should feel happy and confident visiting Pembury Dental Surgery. Our aim is no fear and no fillings! Children are seen under the NHS. New child places are currently available. We offer same day appointments to patients requiring emergency treatment. As these appointments are limited, it is advised that patients contact us as early as possible on the day. Root canal treatment is needed when the blood or nerve supply of the tooth (the pulp) is infected through decay or injury. If the pulp becomes infected, the infection may spread through the root canal system of the tooth, this may eventually lead to an abscess, which can be very painful. The aim of the treatment is to remove all of the infection from the root canal. The root is then cleaned and filled to prevent further infection. Following root canal therapy, a crown may be required to strengthen the tooth and bring it back to its full function. A dental crown (cap) can be fitted over a tooth that is significantly damaged in order to protect it and prolong its useful life. Crowns are often used as a permanent restoration when it is no longer possible to repair a tooth with a filling. A crown will strengthen a tooth whilst giving a natural tooth like appearance. A bridge is a fixed dental restoration used to replace a missing tooth (teeth) by joining an artificial tooth permanently to adjacent teeth. Crowns and bridges can be made from a variety of materials including, porcelain bonded to metal and metal free crowns. Veneers can be used to improve the colour, shape and position of your teeth. They instantly improve your smile by hiding discolouration, closing small gaps and repairing chips and cracks. Veneers can be used in some cases as an alternative to orthodontic treatment. We carry out inlays and onlays as part of our minimally invasive approach and they are used to preserve tooth structure. Onlays are restorations placed usually on the chewing surfaces of the back teeth and Inlays are used to replace fillings and fit in the tooth. These can be made of either composite or porcelain materials. Missing teeth can be replaced with dentures. Function is restored and will improve the way you look, bite, chew and speak as well as contributing to a great smile. Dentures can be made of acrylic or chrome (metal). We also offer the latest in flexible dentures. These comfortable dentures fit snugly around your existing teeth, often eliminating the need for visible clasps. Tooth whitening can be a highly effective, yet very simple method of lightening the colour of teeth which does not require the removal of any tooth structure. Whitening can only lighten your natural teeth, it will not lighten any bridges, crowns or veneers you may have. This will be taken into consideration on the assessment of your teeth.